Braden and Quin Reis share a tragic past, but it’s now up to them to save the future. When a secret conspiracy resorts to harnessing the powers of the Netherworld to save their legacy, Braden and Quin are the only mages capable of stopping them. But these two would-be heroes are compromised, harboring terrible secrets. Betrayal and failure infest this story, with scant moments of triumph. Spencer teases the reader with glimpses of success and hope, making for an experience that compels you to keep reading, to keep hoping the next plot will work out. It's unsettling, mesmerizing, and addictive. I devoured this book. I read until my eyes were soupy. I had some vague understanding of where things would end up, and I desperately needed to see how it unfolded. I had started with Darkmage, the first book in The Rhenwars Saga, then backed up and read this prequel. There were some things I liked about doing it this way. Darkstorm takes place a thousand years earlier, and thus shows the origins of some of the artifacts and traditions you find in Darkmage. It was cool, knowing where these circumstances would lead, but if you want a truly spoiler-free experience with this series, then start with Darkstorm. Those Reis brothers! What can I say about them? They have some issues for sure. I am impressed they still talk to each other after finding out the history that went down between them. Their relationship is fraught with conspiracy and tragedy. While Braden is more of an optimist and one to take action, Quin has a tendency to be consumed with cynicism, but he keeps going despite all the odds, because he does love his brother deep down and wishes he could feel more like his equal. 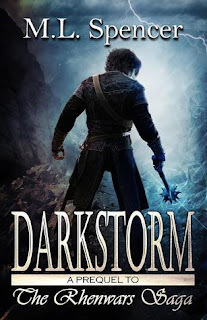 Darkstorm really explores extreme choices made with good intentions, how small actions conceived in self-preservation can lead to dire consequences. It's an excellent exploration in moral ambiguity. It teases that line of when and how to defy the rules, that point where justice lives more within revolution than institution. While the sympathetic characters are generally from one side of this conflict, it's clear that both sides are desperately trying to do what they think is right, and the fate of their entire existence is at stake.